These six to eight week old babies are part of the Rockerville Colony, a colony of about 25 feral cats living in Rockerville, south of Rapid City. It is just one of many colonies the Coalition has helped. 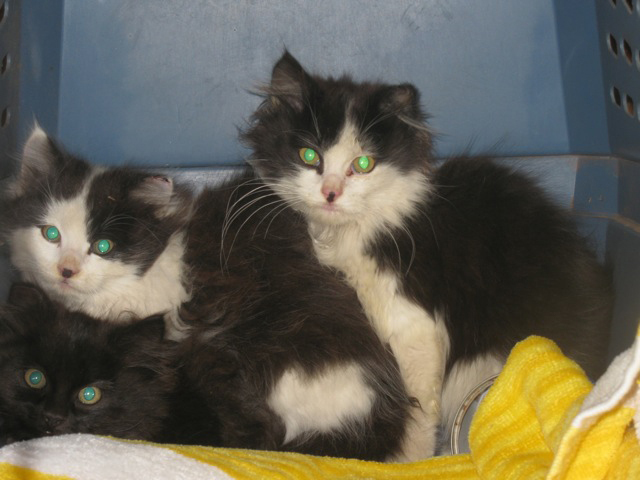 These babies were trapped, spayed/neutered and released (TNR) in November 2011. Part of TNR is making sure that someone cares about the kitties after they are fixed, and for the rest of their lives. These kitties lives have been spared from euthanasia, and they will not have kittens that will ultimately die in a shelter or of starvation or disease. The Coalition has helped people fix almost six thousand cats, both feral and domestic. Photos by Laurie Kampfer. The Spay/Neuter Coalition wants to help South Dakota feral and barn cat caretakers humanely control their cat populations. With up to 100 cats in a colony, many caretakers struggle even to feed all of their cats, and simply cannot afford spay/neuter surgeries. That's where we want to help. We believe that a stable feral cat population is healthier and happier than one that faces constant pressure from competition for resources due to the arrival of new kittens. We want to help caretakers end the constant cycle of birth and death that a breeding colony faces. We will always help feral cat caretakers trap, spay/neuter and release (TNR) members of their colonies for $35 per female, $25 per male. We occasionally get grants to help feral cat caretakers and can cover the costs entirely (though we are legally not allowed to pay for rabies vaccinations, which can sometimes be required, depending on the surgeon). 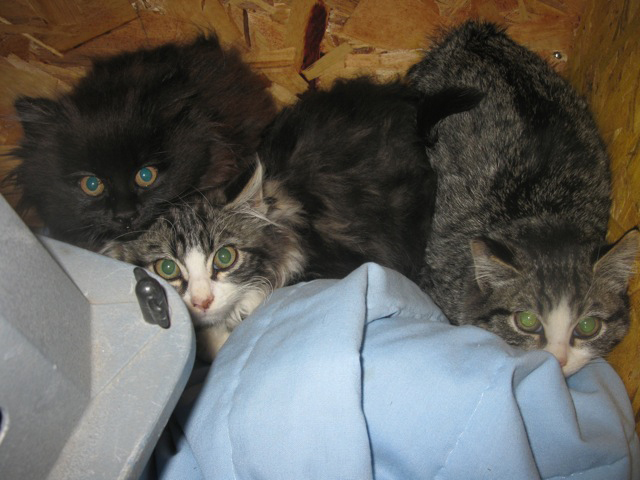 We believe in TNR for South Dakota's feral cats, and want to help you! A feral cat is one that is born and has lived without being touched by a human being. Kittens up the age of eight weeks can be easily tamed, which requires caretakers to be diligent in seeking them out and catching them. Feral cat colonies will grow in direct proportion to the amount of food available, with a single unaltered female and her offspring producing hundreds of cats within a few years. Because they are unsocialized, healthy, beautiful feral and stray cats (such as the Rockerville kittens pictured above) are routinely killed at shelters throughout the country, including those in the Black Hills. It doesn't have to be that way. In the early 1990s, in various places throughout the U.S., a new program was initiated to deal humanely with feral cats. Alley Cat Allies focused on feral cat residents of the Atlantic City Boardwalk that had been proliferating there since the 1880s, and had been scheduled for extermination. The Alley Cat Allies began a Trap-Neuter-Release (TNR) program to humanely stabilize and reduce that population. They estimate that the Atlantic City feral cat population has decreased by 71% through TNR. TNR has been employed only on a very limited basis in South Dakota, with the Coalition being the primary provider of spay/neuter assistance to feral cat caretakers in our region. The SD West River Spay/Neuter Coalition initiated such a program in the Northern Hills, and we have expanded our TNR efforts into Rapid City and the southern Hills. I never see any feral cats around me. You don't see them, but they are there. National Geographic estimated the national feral cat population to be approximately 70 million in 2004. Feral cats and kittens form colonies (families) near human beings and survive by eating trash and discarded food, and preying on the rats and mice that also gather around human food waste. Studies reveal that eradication efforts only succeed in isolated locations such as small islands. If the attractors remain, abandoned or feral cats will migrate to the location and create a new, fertile and growing feral colony. Aside from the fact that eradication has historically been performed in ways that are tremendously inhumane, such efforts tend to be far less effective than the recognized Trap/Neuter/Release method that takes advantage of natural feline behaviors to stabilize the population. Don't cats fend for themselves? No, they get sick and die slowly. They also starve or freeze to death. Doesn't that sort of solve the problem? No. Feral cats congregate around a stable food source, often garbage or vermin. Sick and otherwise debilitated feral cats form unstable colonies, attracting new, unaltered ferals. These cats, even when sick and injured, will reproduce, as will human beings under similar conditions, with tragic outcomes. A healthy, stable, managed population of feral cats will protect their territory, and prevent large colonies from forming. Here's a great tutorial on how to trap feral cats. HSUS has a feral cat FAQ, and a great article about what you can do to help feral cats.